Hey, y’all! Thanks for inviting me to come share my story on HeroPress. I’m so excited to be able to talk a little bit to the HeroPress community. So, and I’m doing a video blog or vlog because this is what I do; I’m a YouTube person. I create YouTube videos every single Wednesday for what I call WordPress Wednesday to help you improve your online marketing inside of the WordPress world. So I’m used to doing videos, and I asked if I could do my HeroPress story in this format; and they said go for it, so I’m excited to talk to you at least in a face-to-face scenario. I’m going to share a little bit of my story and tell you how WordPress basically became my avenue for becoming a millionaire in just five short years. So in 1998, I created my very first ever HTML website. My dad was actually doing websites at the time, and I needed a website for my band because that’s what I wanted to be is a rockstar; so I learned how to build a website, kind of, under his training and a little bit of self-taught stuff and had a lot of fun doing it that way in 1998. And then in 2005, I started hearing about WordPress; but in 2008, as I was freelancing around, a client asked me to build him a website. And they said, “hey, Kori, can you, can you build me a website, but we absolutely have to have it on WordPress?” I was like, sure, no problem; straight to Google, “how do you build a WordPress website”, you know. And over the weekend I pretty much taught myself how to build out a WordPress website, and I loved it. My mind was absolutely blown when I saw the drag and drop options inside of menus to create dropdowns, and a form builder; I was just blown away. So those of you who have struggled in the HTML CSS world, you know the magic or the majesty, if you will even, of WordPress and those environments and how easy it makes it. So when I saw that, I really just thought, oh my goodness, this is a full-circle moment for me. I really want to use WordPress now from here on forward. So I reached back out to my dad and said, “hey, dad, you know, this is a tool that our customers, all of our clients, have been asking us for”. They’ve been wanting access to their websites, and we’ve not been able to give it to them because, in the past, they had to download Dreamweaver, you know, Photoshop and an FTP program; and that was just too much nerd code for them. So we wanted to be able to give them something like this, and WordPress definitely was that solution. So he and I worked back and forth for a few years learning, really truly learning, WordPress; and then in 2012, we decided to launch together, my mom, my dad and I, decided to launch WebTegrity in San Antonio, Texas. And it was a very small concept initially; you know, we just me, literally, the three of us, and me and my folks. And then we hired on a subcontractor who is a great graphic designer here in town to try to help us with the creative side of things, and we started to grow our team. So how did we, in five years, build it up in such a way that we were able to sell it for a deal of a million dollars’ worth of shares, which ultimately is a $20 million value deal? How did we do that? I’m going to give you a little bit of insight on how we were able to accomplish that in such a short time. So the very first thing I want you to realize is we did this in a saturated industry in San Antonio, Texas. When I did a search for web developer or web design firms back in 2012, I had over 700 results of different either freelancers or agencies or ad agencies or some solution out there that was either in the general area, or in the nearby area, that provided that service. So how did we, in six years, end up becoming number six in the entire city? We ranked in the top 10; how did we do that? One of the very first things we did, was we niched ourselves; and, thankfully, WordPress was that solution. In 2012, there was not an agency directly in San Antonio that was trying to be the go-to place for WordPress; and we purposely started stepping up and saying we are WordPress only, WordPress only, WordPress only. So if you were looking for a different type of CMS solution, we were not the right fit for you. And very, very quickly, we also started teaching it in the city; so we would teach other agencies. We provided on-site training; we provided weekend workshops. All for a price tag, of course; but that was one of our revenue streams. And, again, it set us as the authority in the city for WordPress; so really important that you understand how to niche yourselves and not try to be all things to all people. The second thing we tried to do was really build a culture. And you can see, I don’t work around boring walls. Everything that I do has to have creative juices flowing around me, right. We just want to create a great culture, a great environment. So we had to hire the right people. So that’s my next tip to you is be very, very careful on who you allow into your culture of your business, who you hire on, and certainly who you bring on as a leader in your culture in your community. So one of the things that we did right away was realize that we can’t teach passion, so you gotta find people that have a passion to nerd out on stuff like this. And you have to find people who have great integrity to just do their best at all times, and you have to find people who love to be creative and love to solve problems for clients, right, who aren’t just salespeople, right? So if you can find those things, you can teach nerd code all day long; so be sure to just find people with the right hearts to join your community and then train them up the right way, be sure that you just grow and grow and grow your culture in a healthy way, right. And another thing that we did, so this is another tip, was understand how to really build a revenue stream that was going to be sustainable. All right, so wrap your heads around this one because this one’s key. Very early on in our model as we were selling WordPress websites, part of my pitch was, oh, it’s just five grand and no more after that. It’s a one-time fee and you’re done. That’s a horrible business strategy. We learned very early on, inside of WordPress world, that you have rain or shine, right; so there’s a lot of clients coming or there are no clients. You’re either slammed working from home even in the evening trying to catch up, or you’re out on the golf course wondering if you’re going to get a paycheck next week. It’s really rain or shine. So how do you create a sustainable model in your business, in your small agency, in your startup; how do you do that, so that when those slow seasons come, you can still pay your team members, you can still keep your lights on? Well, we were sitting at a WordCamp; and Jason Cohen from WP Engine was keynoting; and one of the things he said right away is, if you don’t understand how to create a reoccurring revenue stream in your small agency, you will turn your sign to closed in the next year or two. And he was so right; and it was such a light bulb moment for me that I went back straightaway from that weekend WordCamp up in Austin and I started writing out, okay, how can we create a reoccurring revenue stream? What would that look like inside of our industry? And, of course, it was support packages. We didn’t call them maintenance plans. We certainly didn’t use retainer, which can have a sense of a negative connotation, right, because of lawyers; sorry! But, still, we didn’t want to use those words because we’re already almost creating a, uh, I don’t think I want to sign up for that type of attitude. What we did is we called it support, and very easily, clients were signing up saying, oh, goodness, yes, I need that ongoing support. So use that phrasing, create a model structure where it’s required, at least for the first 12 months out of the gate as they launch that you are charging them something even as small as $99 a month. And don’t shortchange yourself on that; put together a great package that you give them that type of value. If you were to check out WebTegrity.com, you would see our support plans and what they consist of and the pricing. We’re very transparent with that. That’s the way our revenue stream almost doubled our sales in one year and allowed us to keep our lights on when June and July roll around and nobody cares about their websites because they’re on the beach. All right, reputation was another huge part of it. That’s one of the reasons why we named ourselves WebTegrity, but reputation, understanding that that every client that signs up, whether they’re a $5,000 website or a $50,000 website gets the same type of boutique-style, white glove, handholding relationship, right? Every single project that you launch, you want to produce the absolute, absolute best. You’re not shortchanging them; you’re not, you’re not wiring something that you hand off to the client and hope to God it doesn’t break. You really are trying to find the absolute best solution. One of the things that also kept us in high standing with our reputation, of course, was offering that training because what we don’t want to do is keep the veil covered where nobody can see what we’re doing, right. We really want to be transparent and train our clients the nerd lingo, train the clients what SEO is and what expectations should be. Having that type of open communication really just started to build together a relationship with our clients that they trusted us; and we met their expectation, right. So be sure to hold strongly to your core values for your reputation. Be sure that you’re asking people to give you great reviews because that’ll make a difference. And the last thing I want to talk about is give back. So at one of the WordCamp US’s that I went to, Matt himself said, listen, if you’re making a living with WordPress, you really need to try to figure out how to give back 5% of your time, just 5% of your time a week. How can you do that to give back to the community? Can you start a meet-up group, teach a meetup group; can you facilitate a meetup group where maybe you’re just the organizer and you never have to speak because you’re not a fan of speaking? Can you organize a WordCamp, volunteer at a WordCamp? Can you write a tutorial and tell people how to do things? Can you teach a workshop; can you make a video? And, again, I had a light bulb moment. Of course, I can make videos. So my giveback to the WordPress community is my YouTube channel; every single Wednesday, I’m creating a video and putting it out there for free to the WordPress world of how to improve your online marketing. That’s made a huge impact not only, thankfully, inside the WordPress community, but also in my own business model. I actually go into WordCamps around the US and people are like, hey, aren’t you that WordPress girl; don’t you do videos? It’s a really cool feeling to be able to give back to the community because I’ve made my living using WordPress. So ultimately how did I turn five years into a multi-million dollar buyout? Because we have just recently sold; how did we do that? Ultimately, it was understanding that you have to be able to grow something of value. So as soon as you start your business, you should also be thinking about your exit strategy, right, even in how you name your company. If I were to name this Ashton Agency, do you think that I could’ve just walked away and handed the keys to somebody else named Johnson; it wouldn’t have worked. Think even about your name; will it stand alone? Can that become a brand that you can hand off and sell as a holistic entity? You also want to think about that revenue stream, right, and watch those sales margins. Be sure that your margins are healthy. Don’t hire until it hurts, until it absolutely hurts. Be sure that you’re structuring your offerings in such a way that you’re actually recouping your value. What does that mean? Just understand business better; watch Shark Tank, read more tutorials like this, watch more videos. Get a hold of the WordPress community, the core leaders, the speakers that travel around to all the WordCamps. Start following them on Twitter and trying to understand what it is that they’re training and teaching. There’s a lot of resources out there for you to gain some ideas from, but ultimately it was me stepping out in the San Antonio community because it was a larger firm here in San Antonio who purchased us. So we just kept hammering on the fact that we were the go-to place here in San Antonio for WordPress. We kept training; we kept doing free opportunities, going out and speaking at different events; and people kept seeing us. We kept showing up, so you’d be surprised what happens. If you keep giving back and you keep showing up to places, you keep establishing yourself as the authority, you keep learning and training and growing your own skill set and growing your team, before you know it, it can happen for you. I hope this has been helpful. If you have questions about some of this though, if you’re trying to grow up your startup, or if you’re trying to learn how to improve your revenue margins, I’m always open to a quick twitter conversation or send me an email. I’d love to connect with you. Thanks again for the opportunity to share this on HeroPress. Bye, y’all; catch me over on YouTube. Bye! 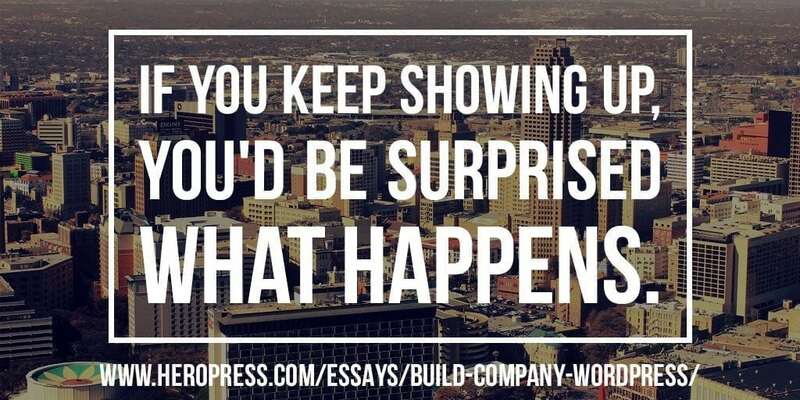 The post How To Build A Company With WordPress appeared first on HeroPress.